Most people learn about Elk Horn when driving past signs on the Insterstate for the Historic Danish Windmill and Museum. This town gets its fair share of tourists to take the freeway exit and check the place out. 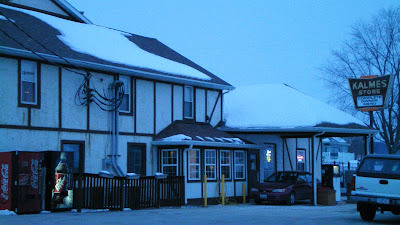 Many visitors see the huge parking lot at the Danish Inn and Buffet and don't travel any further into town to get something to eat. 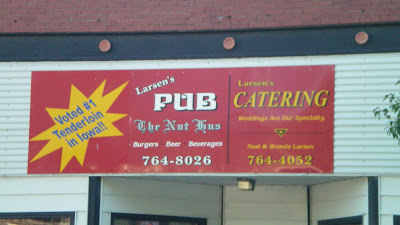 They would be missing out on an IPPA Best Tenderloin in Iowa from 2007 in Larsen's Pub and Catering just a few block north. 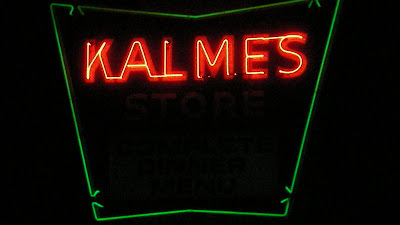 Location: 4206 Main St in Elk Horn (population 649) in Shelby County, in Western Iowa. Directions: Take the Highway 173 exit north from I-80 between Des Moines and Omaha. The Pub is right on the main street a few blocks past the Windmill and Museum, maybe seven miles off the freeway. 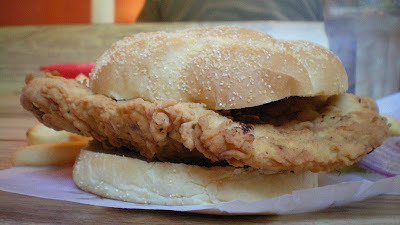 The Tenderloin: What makes the tenderloin here so special is the great thickness and special blend of seasonings in the breading. 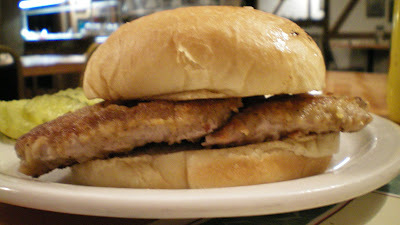 This is one of the thickest tenderloins that both maintains is shape and is soft and moist inside. 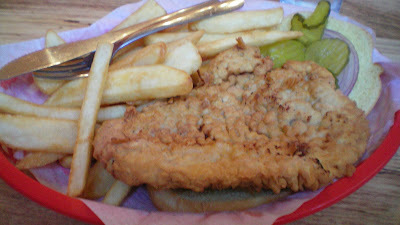 Parts of the tenderloin are thicker than others, nearly all fat is trimmed off. 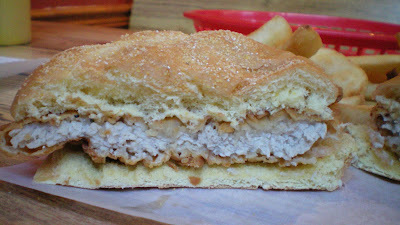 The The breading forms a darker brown layer over the pork with black pepper and other flavors. The overall score has to be reduced for the untoasted bun, a 8.0 out of 10. 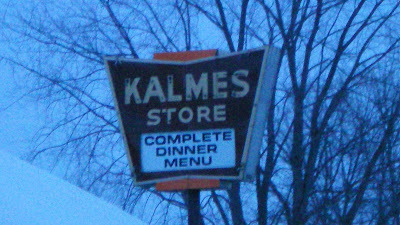 Also on the menu: The menu has burgers and the usual fried stuff with homemade sides. Service: It was table service with an overworked guy waiting tables, tending bar, and cooking. 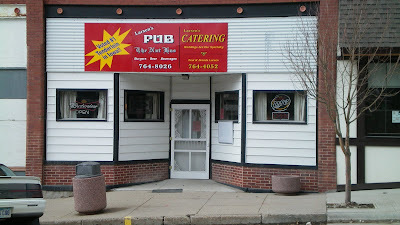 Ambiance: Typical pub and grub interior with beer signs, seating at tables and booths or a bar. The crowd seemed to have many regulars or lifers who all seem to want a tenderloin, I assume its these people who gave the place the nickname "The Nut Hus" as the sign implies. Final Thoughts: This is the second of the Western Iowa Tenderloin Trail entries, which will include stops in Dunlap, Hamlin, Audubon, and Atlantic in addition to the Red Bard in Exira I wrote about earlier. 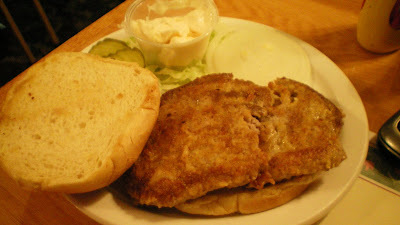 The award-winning tenderloin is perfect to handle the hunger accumulated while watching the hour-long documentary about windmills and browsing the deep selection of Danish junk at the museum.